Historic Environment Scotland (HES) and the Glasgow based Centre for Digital Documentation and Visualisation (CDDV) are leading the way in dramatically changing the visitor experience at the Antonine Wall in Central Scotland. With European partners, they're developing cutting edge technology which has received £150k from the Creative Europe Programme, to bring the Roman ruins back to life. The three year Advanced Limes Applications Project is a partnership between HES, CDDV, the Bavarian State Department for Monument Protection and Austrian firm, Edufilm und medien GmbH, specialising in the production of heritage-based digital applications. 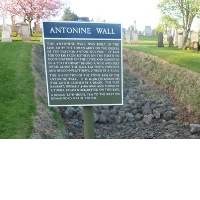 The project aims to build on previous work carried out by HES and CDDV to create digitally an accurate 3D image of the Antonine Wall as part of the Scottish Ten Project. HES is a member of Scotland Europa and received dedicated support from the team throughout the application process. This EU funding award will help develop the technology to provide an interactive visitor experience through augmented reality and the use of 3D virtual reconstructions. The technology will showcase Scotland’s heritage on a world-wide digital platform allowing virtual visits from anywhere, and will be initially tested in schools in both Scotland and Germany.